Penguins are now officially OFF the cute list! Okay, only that one, the others are still cute. now they flee the room. is her need to live too great? as fast as she can pounce? And you wonder why we humans got rid of our tails. Sheesh, they were almost as bad as capes……. Loudly, sternly and hit someone with a stick. Perhaps Kayas’ destiny poker? The great question now is : they’re in the necromancer room , what if the door for the gryphon lair has closed too ? That would mean they’re screwed, of course. SLAM EEP! It almost does it! Why is he doing that; I do not know! You are OK; Do you have anything? I just built a penguin. He is the only person on earth and I’m sorry to bring him back. Why brrrrm, Kaya? We can do it easy … why are you betting my penguin? Quickly! a beast of doubt and lies. to avoid being flattened like a pancake? This penguin was not a friend. Now the question is if the mysterious rumble announces an Indiana Jones style rock trap or a full cave-in. And what will Kaya do about the Pan- eh Griffin and Kenny? 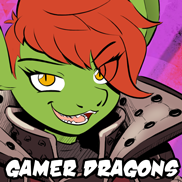 And btw, is it just my browser acting up or does the Gamer Dragons link preview still show the card game instead of the newest comic? I remember Robin writing that the preview pic will be updated when there is a new comic. Kaya seems to have a knack for setting of traps, doesn’t she? I wonder how many Kaya-induced facepalms there were/are/could be? Okay I think I have this thematically confused dungeon figured out: it started out as an ore mine until a vein of diamonds was uncovered. Diamonds in d&d are used in almost all magic involving reincarnation, (living) reanimation, cloning, basically anything you could use to subvert death. The owners used the diamond to craft the crystal duck (possibly the others too I don’t know what they’re made of) an attempt to become immortal. This failed because the owners didn’t know what a Phoenix was, just that there was a death beating bird in the world. They sealed it away to hide their failure. But the artifact still had power that someone with an affinity for necromancy can use. I am the terror that lurks in darkest cave. I am the artifact that reanimates your enemies. I am …. Crystal Duck. Evil cousin of Darkwing Duck! Well, it appears my penguin-related comment never went through last week, but I’m happy to say I’m still here. (I probably forgot to hit submit or something, I had just woken up when I read the comic.) xP This is TOO CLASSIC for Kaya, I love it. This needs to be a new rule of the internet: If there’s a trap, Kaya will find a way to trigger it. No exceptions. The expressions in this panel are priceless as well. All in all just really well done. Keep up the good work Robin. Stay awesome. I checked if your comment got stuck between the website’s door but I didn’t see any comment still pending or waiting for approval from me, so I think your guess might be correct. It occurs to me that most of the traps/problem are aimed a letting Kaya give maximum annoyance to the other team members–almost as if the DM was getting even with her for something like oh, say, knocking him down while saying “hello” or something…..
Of COURSE you can’t trust penguins. The cute and cuddly thing is just an act, beneath that they are least plotting. “Is it alright?” (wiggle-wiggle) 🙂 Kaya is 100% the star of this page! (for me) Holding the end of her own tail to make sure it’s okay is great; especially in panel three. (Body pose in panel two, also!) And I love her expressions all the way through! Perspective is fun in the last panel. I like looking at the difference in tail views. Is Kai developing a crest or is that just a cow(dragon)lick on the top of his head? I am the trigger of my trap. Steel is my pedestal and crystal is my body. I lay in wait over a thousand days. My whole life was Unlimited Trap Works.